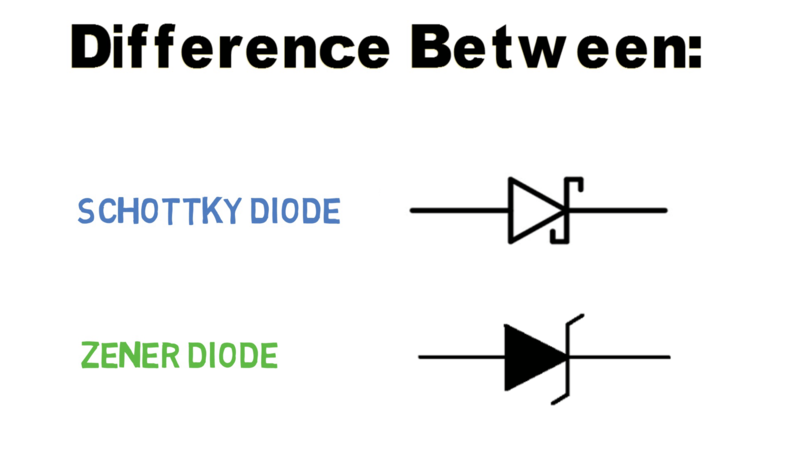 So in this post, we are going to see the basic difference between two of the most widely used diodes: Zener diode and a Schottky diode. When a diode is switched off suddenly, the fwd current flowing through the diode takes a small amount of time to die down and this time is called Reverse Recovery Time. Unlike a rectifier diode, junction of Schottky diode is between n-type semiconductor to a metal plate. Schottky diode, also known as barrier diode is mainly used in low voltage circuits because fwd voltage drop of Schottky diode(Vf) is less than a rectifier diode; typically in the range of .25 to .5 v.
Let’s say you are working on a very low voltage(say 3v) circuit and you need a diode in that circuit. In this case, it is better to use a Schottky diode because there will be very less voltage drop across it. And there will be enough voltage left for further use. Also e- are the majority charge carriers on both sides of the junction, thus it is a unipolar device. It is mostly used in high-frequency applications like in an SMPS. And that’s because of less temperature rise and high switching speed pertaining to its small recovery time. When a diode is switched off suddenly, the fwd current flowing through the diode takes a small amount of time to die down and this time is called Reverse Recovery Time. compare to a normal diode reverse recovery time of Schottky diode is much smaller, making it suitable to be used in fast switching circuits. Now disadvantage of Schottky is its low breakdown voltage ( 20v to 40v ) making it unsuitable for a rectifier circuit. As an example, let’s say we are designing a buck converter like we did in one of the project videos: “Buck converter using Arduino“. Since Mosfet in this circuit is switching with a very high frequency, diode you need in this circuit should have high switching speed. Thus Schottky diode is an optimum choice. A Zener diode is made up of p-n junction but heavily doped compared to a normal diode. As a result, it can undergo break down without being damaged. And Due to this property only, Zener is used as a voltage regulator in electronic circuits. In fact, Zener diodes are never used for rectification purposes. Here’s a circuit in which Zener diode is used to prevent the MOSFET gate from destruction by clipping off voltage. The breakdown voltage of this Zener is 5.1 v. Now if accidentally voltage at the gate of MOSFET exceeds 5v, diode breakdown and all current flows through the diode to ground. Thus preventing the MOSFET from any kind of destruction. Here’s another circuit in which two diodes are connected facing each other’s p terminal. If an A.C signal is given at input, one diode clips of voltage in positive half whereas other in negative half and thus we get voltage under the specified limit in both half cycle of a.c.
As an example, I used 5V Zener in the project “ Digital voltmeter using Arduino” in which it is connected across the capacitor to prevent Arduino in case voltage at its analog pin exceeds 5v. And with that being said now you know all the basic differences between Schottky and Zener diode and when to use one. Magnificent items from you, man. I’ve take note your stuff prior to and you’re simply extremely fantastic. I really like what you’ve got here, certainly like what you are stating and the way in which in which you are saying it. You make it entertaining and you still care for to stay it sensible. I can’t wait to learn far more from you. This is actually a tremendous web site. Next Post: Why Earth pin is made thicker and bigger than live and neutral?